Women in Science: One of the smelliest jobs in science? One of the smelliest jobs in science? I know I said "family obligations" last week, and so I did: family visited from out of town. One nice thing about vacationing from home was being a tourist in my own back yard. 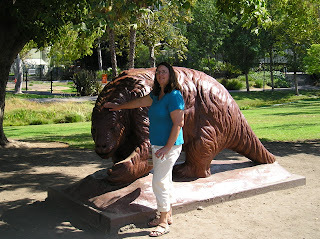 One day we took a trip to the La Brea tar pits in Los Angeles. Pit 91 was being excavated in what has to rank among the dirtiest jobs in science: painstakingly excavating bones from gooey smelly asphalt. The afternoon we were there, all the excavators were women. Anyone who claims that women won't do dirty work is just clueless. Here's a video showing the kind of excavation going on there (note: it's set to The Who, so you might want to turn the volume down if you're pretending to do something productive!). Painstaking, to be sure, but it must be thrilling to make a find. If you are at least 16 years old and in the Los Angeles area, you can volunteer to either work on the Pit 91 excavation or in the science laboratory, no previous experience required! Check out the Page Museum/tar pit web site for details. And here I am next to a giant sloth which I hope isn't going to end up my blogging mascot . . .